You can in fact grow almost any plant in a container, so whether you would like to brighten up your patio, or grow an edible feast, it’s simply a matter of choosing suitable plants for the particular conditions. Once you have decided which particular look or style appeals, the next question is what sort of pot or container? There is a wide range available to choose from. If providing drainage holes presents a problem you can use plastic pots inside, raised up on a small amount of gravel or chip stone and keep a check that they don’t get waterlogged. 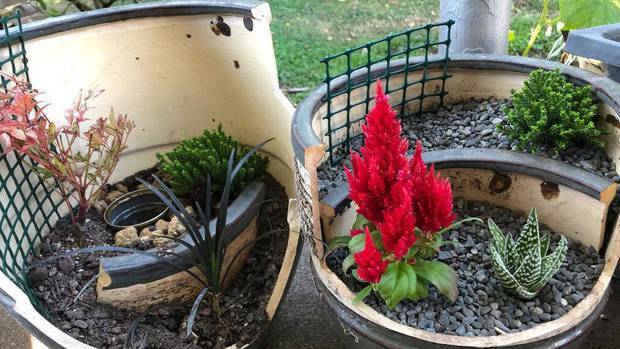 A fun activity particularly good with children is to use a broken pot to create a miniature garden with different levels. You can also add miniature furniture and fairies to these gardens too.